Over the last week I have begun preparing my garden for the next planting season. All of a sudden, my butternut vines were near death, so I knew it was time to prepare for moving forward. The state of my garden after many of the leaves died. I have yet to harvest and cure my squash because of Cyclone Dineo. We had rain last week and the weather forecast shows rain for this week too. The vines are still growing and producing new butternuts, so I am hesitant to pull up all the plants. I decided to take some action, though, by rerouting the growing vines back onto themselves, covering some of the decaying leaves and freeing some of the beds that were covered. I had hardly entered my garden in the last month because the butternut vines took over all the existing space, leaving me nowhere to safely walk. The newly dead leaves and rerouting of the vines allowed me to pull weeds and begin double digging one of the beds I did not get to in October and November. I have lots of beds to double dig and amend the soil, but I can only do this once the butternuts are gone. Last week also included the arrival of a variety of heirloom seeds I ordered. I am most excited about these because I was looking for a more colorful variety of plants than what is available here in Swaziland. I joined the heirloom train in spring 2015 when I finally had room to grow a large container garden and a few spots of ground to plant in. Thanks to Wasatch Community Gardens’ annual seedling sale and an excellent variety of seedlings at Millcreek Gardens, I went crazy. 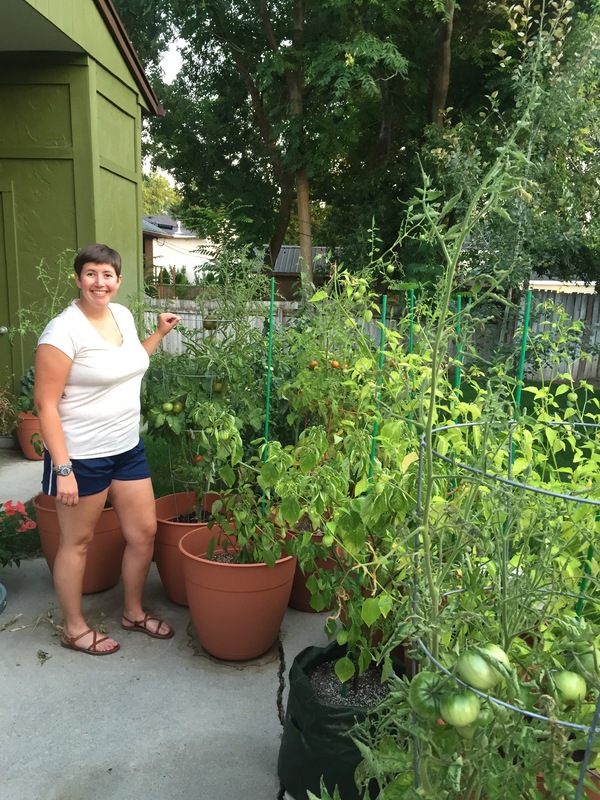 I grew tomatoes, tomatillos, bell peppers, hot peppers, kale, spinach, lettuce, potatoes, raspberries, and strawberries in containers in 2015. Although I had that garden for only one year before moving to Swaziland, it really showed me what I could do here. Of course, growing up with a garden at my parents’ and grandparents’ homes helped too. What has been hard here is knowing what to plant and when. I now live in a frost-free zone that gets an incredible amount of rain in a few months. In the US, I knew what to plant in early spring and later spring. I learned I could grow tomatoes from April to November, and that those tomato plants could be 7 feet tall. And here, I know nothing. 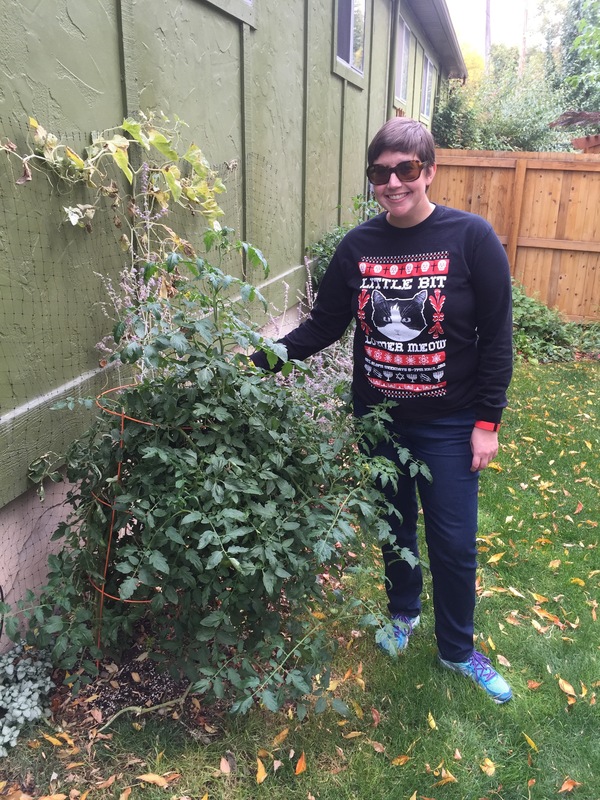 Standing with my doubledover Cherokee purple tomato plant with a miniature cantaloupe trellising behind me on a late October day. When I was finally given garden space on a chilly day in October, make told me to plant what I knew and hovered over me. This meant I did not get to double dig those beds that had been amended with manure. I planted beets, onions, tomatoes, green pepper, and butternut. Only onions, tomatoes, and butternut grew. About a month later I tried germinating seeds, which seemed successful. I had taken over the rest of the garden and double dug a few berms. I added hot peppers and cauliflower to the mix, planting in the berms, and this time, nothing grew. It turned out that it was good that very little grew, because as I have mentioned, the butternut plants took over the whole garden. There are four seasons here that guide what is planted when, as I have recently learned. In November 2016, the wet and hot season began and is now winding down. February and March 2017 start the hot and dry season. In May, the cool and dry season should start. And finally, it may be cool and wet around October. 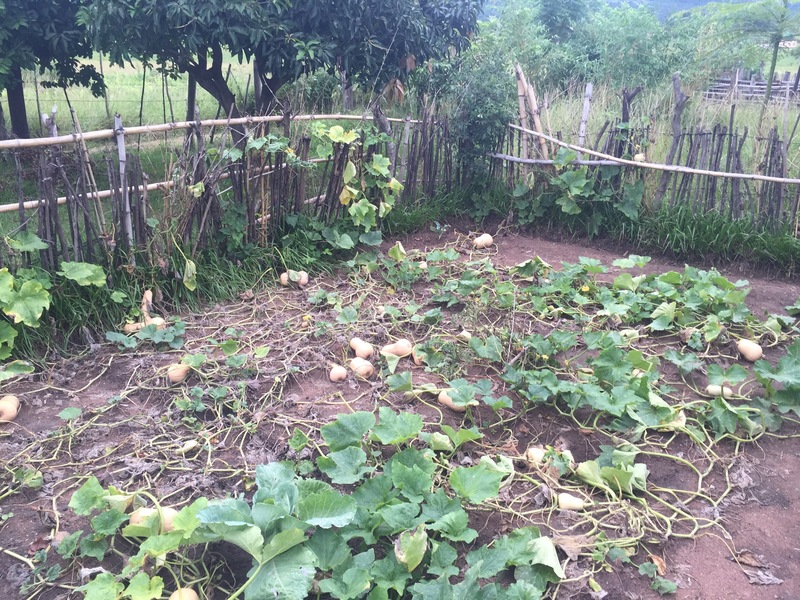 November was the time to plant maize, beans, sweet potato, pumpkin, and squash. My bobhuti who are farmers say now is the time for tomatoes, peppers, and other dry-loving crops that could include maize, beans, sweet potato, squash, and watermelons. In March I will plant onions and carrots. In April I will plant lettuce, spinach, Swiss chard, cauliflower, beets, and strawberry. 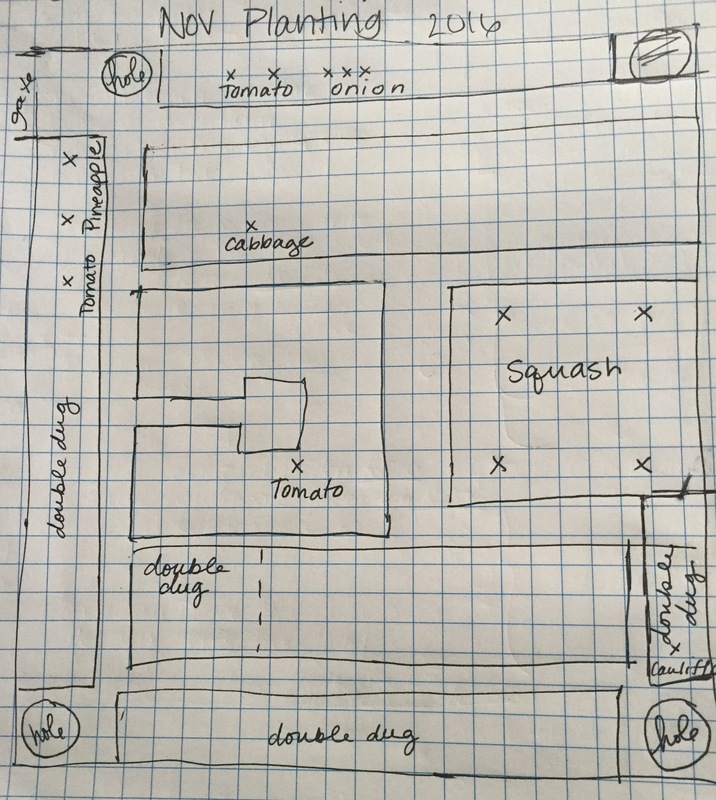 I made two maps of my garden-one of it in November and one of it with expected planting locations, a schedule, and a list of tasks. X marks the spot of what grew from my October and November plantings. 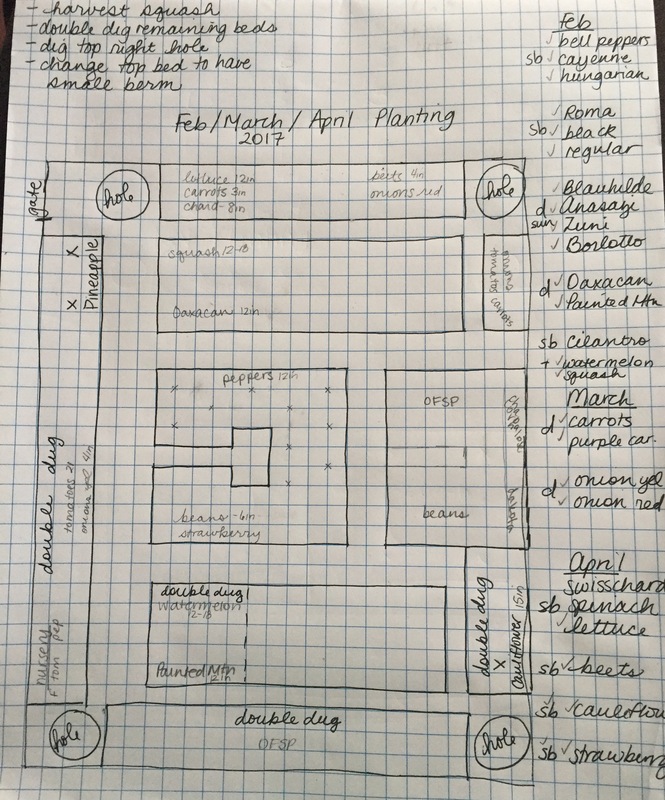 My “summer” and “fall” planting plan. Making this plan calmed me immensely. Looking at my pile of seeds wondering how and when and what will go where was incredibly distracting, so I hope this plan works. All I need now is a little sunshine to start planting. 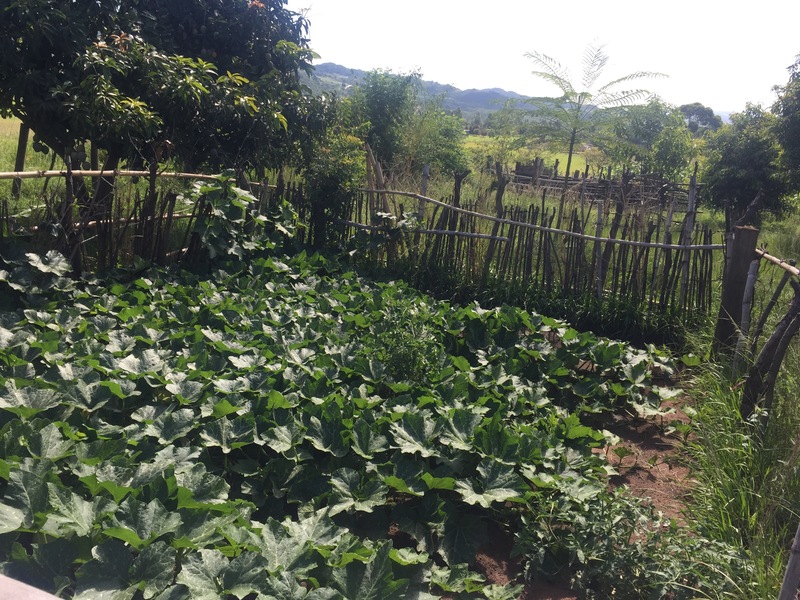 This entry was posted in Africa, Peace Corps, Swaziland and tagged Garden, Gardening, PCV, Peace Corps, Peace Corps Volunteer, Permagarden, Swaziland. Bookmark the permalink.